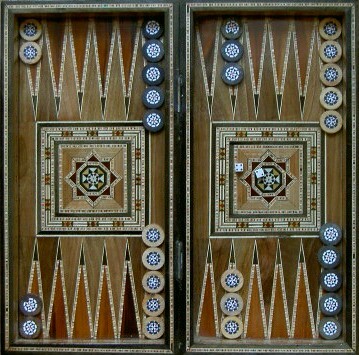 Backgammon as it is played today was not invented in one day but is the fruit of a long evolution. This site retraces the history of backgammon through time. The Game of Backgammon is considered as one of the oldest games with go and chess and was certainly the most geographically widespread. In Antiquity and the Middle Ages, numerous games were played on a board of 24 points and were called "Game of Tables" (See Bibliography and Gallery). 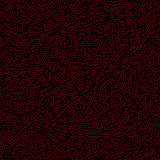 These various games were distinguished in particular by the position of the men at the start of play. The variant of game of tables that used the same initial position as backgammon appeared in the Middle Ages under different names depending on the country where it was played : Todas Tablas in Spain, Shuanglu in China, Nard in Middle East and Golaka-Krida in India. So the initial position of backgammon was known since the 12th century. In Renaissance, this variant was the most played one in England where it was named Irish. It was also played in France under the name Toutes Tables and in Italy under the name Totae Tabulae (in latin). The name « Backgammon » appeared in 1635 in England. Backgammon differed only from Irish in playing doublets twice. The only missing rule was the doubling cube that was invented USA at the end of 20's (Modern Backgammon).